This first week of May has my Norwegian/German heritage brain receiving the following messages: "Arrrrrrrrrrriba (that's me rolling an r), via con Dios, hasta luege, burrito, y si si! It's in my roots to want that southern sun and warmth. In the taste buds too! Ahhhh but don't forget the beauty of the food that is offered with this fantastic Latin lovers cuisine. Most of it is caressed by the gorgeous tomato. We even have it our vocabulary to have a superstar be a 'hot tomato'. So, if you have it; flaunt it. We had a great gathering of friends over for an outdoor easy fare dinner. 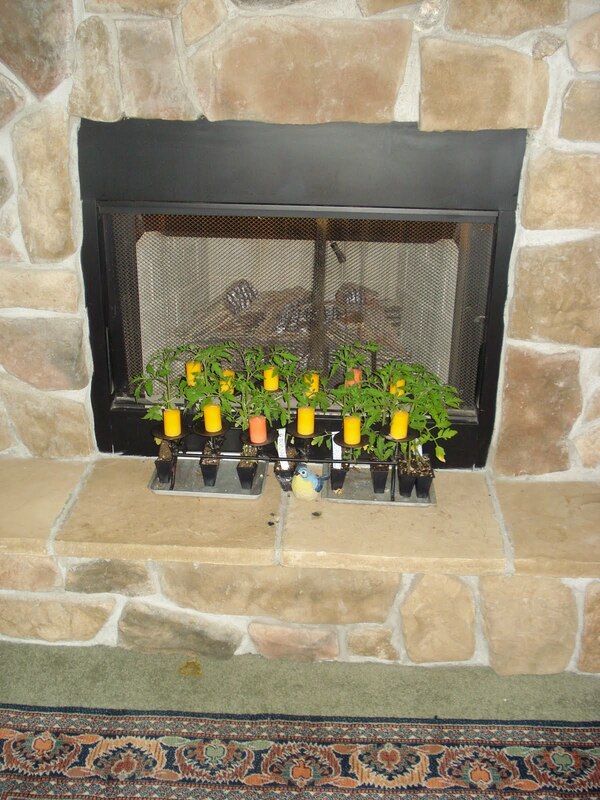 Everything cooperated, little wind, no flying pesky bugs, sizzling grill, baskets of colored peppers and healthy onions for that visual on the counter... And then I spied the fireplace and my unplanted beefeater tomato plants. Oh ho! A Martha Stewart moment was waiting to happen. 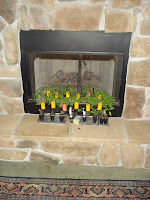 As I placed the plants in between the candle areas, the scent of the leaves let me know I DO love tomatoes, in dishes, on plants, and in hand! Bring on the guests... we are ready: Bienvenido! As one dear friend walked through the living room... his eyes were fixated on the moment that I had out there... for all to see the artistry of a simple plant... and he asked: "Why do you have tomato plants by candles?" Oh! Ron, they look good. "Are you trying to keep them warm?" No. "They need sun to grow." Right. "I don't get it." That's okay... I guess Martha doesn't speak to everyone. So, I recognize that those rolled 'r's and uno dos tres are not within everyone's souls. Not everyone gets it. I realize that Ron is certain I have permanent indoor tomato plants. I know that having fun is a huge part of our Cinco de Mayo celebration. By the way, I called Ron to say that we planted 9 big pots with the tomato plants and staked up 5 more. They are watered and thriving. He thought that was great... but was still wondering what we were going to do with the ones by the fireplace. I'm thinking he planted them there in his mind. I'm not going there! I'd like to be one of your "faces"
I am definitely about to do some browsing around this site! Happy Cinco de Mayo from South & Central Texas. Debbie you and Col K are welcome anytime. Since SA will soon be home to the largest military community in the nation, at least before the next Cinco de Mayo you should check in. Is this the End? or Perhaps Just the Beginning! Would you like a bouquet? Down and Dreary ... What is your message? Seriously?! Don't Tread on Me!